This high-capacity alpine trekking backpack is designed for keen mountaineers and built for mountain environments and long excursions. Its 55+15L capacity and mountain shape offer generous capacity an d a wide base, suited to alpine treks and multi-day excursions. The ALPINE TREK ADJUSTABLE BACK delivers absolute comfort when carrying heavy loads. The back has 3 length settings, adjustable with a fast efficient system via Velcro straps on the back panel. The heat-molded back panel uses ARIAPRENE foam covered with 3D mesh. ARIAPRENE combines comfort, softness and breathability - a hypoallergenic, anti-odor and non-toxic alternative. The back panel is supported by a lightweight, internal aluminum frame, while the suspension system, responsible for load adjustment, features ergonomic foam-padded shoulder straps and hip belt / straps that stabilize the load without restricting mobility. The harness sits naturally on the hips, wrapping them comfortably. Its ultra-comfortable preshaped design has a horizontal pivot, affording high flexibility. Its sleek design breaks with convention. There's no bottom compartment, making room for more ergonomic storage options. The top load opening features an expandable (+15L) collar and a protective, reinforced ROLLING CLOSURE, like a dry bag's, which seals quickly with its compression straps. It's protected by a top pocket that turns into a single, smaller pack able to be used as a sling bag thanks to independent straps - to keep a camera, travel book/map, lip balm and snacks at the ready for local exploration. The top pocket also contains a built-in rain cover, as downfalls don't give warning. The ANAPURNA 55+15 is all about access and storage options: in the main body, a U-shaped zip peels open the front of the pack, like a suitcase, for access to all contents. Front and side stretch pockets are ergonomic and space efficient. The ice axes and poles storage system makes the backpack very adaptable: the QUICK AXE system has quick-access straps that fasten the axe head. The system suits all shapes of ice axe, both ergonomic and straight, and the straps can also serve to stow gear: just configure loops and buckle to pack your poles, mat or sleeping bag. Two pack-bottom compression straps let you fasten a tent or mat. The internal hydration compartment is also very handy: no slowing down to pull out your bottle, and better for packing. Material strength is key: that's why the ANNAPURNA has rugged components. The pack body combines a ripstop weave with TPU nylon threads for increased tear resistance, and CORDURA nylon for rugged and extreme durability. A water-repellent finish offers extra protection from dust, snow and water. Haul loops and other high-stress areas are reinforced to secure your load, while the robust Kodura nylon on the pack base offers enhanced protection to resist tears, pulling and abrasion caused by transportation and the elements. The dense weave combines toughness and extreme durability. 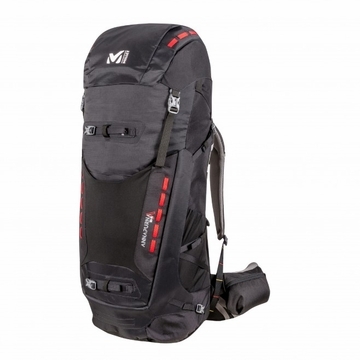 Expandable trekking body with protective Rolling Closure. Removable 2-buckle floating lid, converts into a separate pack.